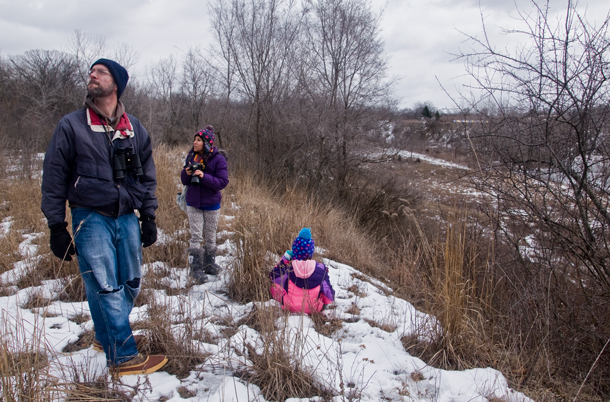 Dave Poweleit, first-time birder Alejandra, and Poweleit's daughter Molly count birds in Kane County as part of a global citizen science initiative. If you ran across a birder last weekend — perhaps a couple peering through binoculars on a Forest Preserve trail, or a lone hiker, field notebook in hand, ears perked up at the faintest chirp — it might not have been apparent, but you likely saw a participant in the largest worldwide bird count ever taken. The Great Backyard Bird Count is one of the most successful examples of “citizen science,” scientific research that relies in part on crowd-sourced contributions from amateurs, hobbyists and lay people, as well as traditional methods. For 15 years the Cornell Lab of Ornithology, Audubon and Bird Studies Canada have recruited volunteers to catalogue their local bird sightings for four consecutive days. This year, the backyards were in 103 countries from Antarctica to Afghanistan for the first global edition of the event. The results help researchers observe long-term trends to a degree of detail that would be impossible to achieve without the contributions of their far-flung and dedicated volunteers. This year featured a new real-time data reporting tool called eBird, which bird watchers are encouraged to contribute to all year long. Scientists will continue to consolidate the data until March 1. Participants marked off sightings on checklists and contributed the information to an international database. They set a new record this year, tallying more than 25.5 million birds across 120,000 checklists. Dave Poweleit led the 5th annual backyard bird count in Kane County’s Dundee Township. His walk Saturday morning through Dundee’s Library Springs yielded only a few finches, some cardinals and one woodpecker. But the importance of keeping up a yearly count, he said, is maintaining a record through highs and lows. Statewide, birdwatchers have catalogued 136 species so far this year. As of Thursday afternoon, birders in Illinois submitted 2,857 checklists — a new record for the state. The previous high was 241 lower, set in 2009. Illinois currently ranks 14th out of the 50 states in the number of checklists submitted. Citizen science initiatives share the burden of data collection, but they also multiply the power of research dollars, in a sense. By enlisting bird watchers who their know their turf, ornithologists can take advantage of advances in data computation without launching unwieldy collection efforts. And it’s a self-perpetuating movement. Poweleit’s 8-year-old daughter was among the birders who braved Saturday’s cold.